There are two versions of SPMF. It offer all of the algorithms except a few exceptions. 2) Read the instructions for installing and running the source code: how_to_install.txt . If you have any questions, you may first have a look at the FAQ, and then ask your question in the data mining forum. If the question has to be private, you can send-me an e-mail. the PHM_irregular algorithm for mining irregular high utility itemsets. This algorithm is simply a variation of the PHM algorithm for the special case of finding irregular itemsets, which is equivalent to finding non periodic itemsets. the LHUI-Miner algorithm for discovering the local high utility itemsets from a transaction database with timestamps and utility information . Those are itemsets that have a high utility during some non predefined time intervals (thanks to Yimin Zhang et al. ). the PHUI-Miner algorithm for discovering the peak high utility itemsets from a transaction database with timestamps and utility information .Those are itemsets that have a utility that is much higher than usual (a peak) during some non predefined time intervals (thanks to Yimin Zhang et al.). the Occur algorithm for finding all occurrences of some sequential pattern(s) in sequences (by post-processing). This algorithm must be applied on the sequential patterns found by another sequential pattern mining algorithms such as CM-SPAM and PrefixSpan. Fix a bug in GoKrimp such that the algorithm would not work with input files containing empty lines, and a bug related to the user interface when GoKrimp was runned without a label file (thanks to Víctor Rodríguez-Fernández). Updated the CPT model so that it can now predict the next element of a sequence containing a single item. the ProSecCo algorithm for progressive sequential pattern mining with convergence guarantees (thanks to Sacha Servan-Schreiber). This algorithm was runner-up for the best student paper award at ICDM 2018. I have added the possibility of displaying the sequences IDs for patterns output by the Fournier-Viger08, SeqDim, TopSeqRules, TopSeqClassRules, and TNS algorithms. In the GUI of SPMF, this feature is used by setting the optional "Show sequence ids?" parameter to true. I have added the possibility of displaying the transactions IDs for patterns output by the TopKRules, TopKClassRules and TNRalgorithms. In the GUI of SPMF, this feature is used by setting the optional "Show transaction ids?" parameter to true. I have added a new algorithm called "Closed_class_association_rules(using_fpclose)" to mine class association rules with a single item in the consequence. I have not updated the documentation for this algorithm yet. The HUIM-GA and HUIM-BPSO, HUIM-GA-tree and HUIM-BPSO-tree algorithms have been reintroduced in SPMF. They had previously been removed due to bugs in the Java conversion of the original C++ code. The problem was that the code was translated from C++ but the memory management model is different in Java and there was some deep copy problem, principaly. The bugs of the Java implementation have been fixed by Chaomin Huang. Added a feature to show the names of items in results when using some sequential pattern mining algorithms with the user interface or command line of SPMF (the documentation will soon be updated to explain this feature in more details). Replaced the FCHM algorithm by a newer implementation called FCHM_bond for mining correlated high utility itemsets using the bond measure, and added the new FCHM_allconfidence algorithm for discovering correlated high utility itemsets using the all-confidence measure. (implemented by Yimin Zhang). I temporarily removed the HUIM-GA and HUIM-BPSO algorithms from the website because the Java implementations of these algorithms have been reported to have a bug. The original implementation were written in C++. It seems that there was some error in the conversion process from C++ to Java. When the bugs are fixed, these algorithms will be added again to SPMF. Added the original implementations of the FAST and CloFAST algorithm for sequential pattern mining (thanks to Fabio Fumarola, Pasqua Fabiana Lanotte, Michelangelo Ceci, Donato Malerba, Eliana Salvemini, Jiawei Han for contributing the original source code). Added an algorithm named TopKClassRules, which is a variation of TopKRules that allows to discover the top-k class association rules, that is the k most frequent association rules that appear in a dataset, where the consequent of rules is an item chosen from a list of allowed items specified by the user. Added an algorithm named TopSeqClassRules, which is a variation of TopSeqRules that allows to discover the top-k class sequential rules, that is the k most frequent sequential rules that appear in a sequence database, where the consequent of rules is an item chosen from a list of allowed items specified by the user. The documentation for these new parameters has not been updated yet but they can be used in the user interface and source code.. The documentation for these new parameters has not been updated yet but they can be used in the user interface and source code. Added a tool to calculate statistics about a transaction database with utility information. Added a simple implementation of the TKO-Basic algorithm for mining the top-k high utility itemset mining. Note that this implementation does not include all the optimizations of TKO described in the journal paper. But this implementation can still be quite fast. Algorithm to calculate the median smoothing of a time series. Fixed some bugs in the TDAG and LZ78 sequence prediction models to improve their performance, and fix other related issues (thanks to Luis Angerstein and Jan Wolter for providing these improvements). Fixed a bug in the output of HAUI-Miner such that the average utility was always rounded to an integer value. Algorithm to calculate the min max normalization of a time series. Algorithm to calculate the standardization of a time series. Fixed a bug in AlgoArrays.java that could cause incorrect results by the TNR algorithm (thanks to Rashmie Abeysinghe for reporting the bug). Fixed a bug such that the optional sequence identifiers in the output of some sequential pattern mining algorithms were incorrect. According to the documentation, sequence identifiers should start at 0, while for some algorithms, the sequence identifiers were starting from 1. Now the sequence identifiers start from 0 for all the algorithms. Thanks to Mathieu Gousseff for reporting the bug. Fixed a bug in the USpan algorithm such that the SWU upper-bound was looser than it should (thanks to Tin Truong Chi for finding and fixing the bug). Fixed a bug for the FEAT algorithm such that it was throwing exception when using the optional parameter to show sequence identifiers..
An algorithm to calculate the regression line of a time series using the least squares method. After applying the algorithm to train a linear regression model, the model.can be used to make some simple predictions. Added an implementation of FHM called FHM(float) which can take utility values as float values instead of integers. For sequence prediction, the Evaluator class was modified so that the SPMF format is used to compare sequence prediction models instead of another format. Fixed a bug in the new version of the Apriori implementation with length constraint. Thanks to Muhammad Yasir Chaudhry for reporting the bug. Fixed a bug in the HUIM-BSO, HUIM-BSPtree algorithms in terms of supported input file format. Thanks to Majdi Mafarja for reporting the problem. Fixed a bug in the output format of PrefixSpan and BIDE+ algorithms (some -1 were missing in some cases). Thanks to Matthieu Gousseff for reporting the bug. Improved the documentation of SPMF by dividing the single documentation page into multiple webpages (for achival purpose, the old documentation page for SPMF 2.18 can be found here). Added two new versions of the AprioriRare and AprioriInverse algorithms called "AprioriRare_TID" and "AprioriInverse_TID". These versions are based on AprioriTID instead of the regular Apriori. They thus keep transactions identifiers of patterns in memory to avoid scanning the database repeatedly, and can output the transaction ids to the output file (by setting the parameter "Show transactions IDs? to true in the user interface). Added a tool to add a value to all item identifiers in a transaction database. This was used to fix the above dataset problem. Added optional parameters for the PFPM and PHM algorithms to specify the minimum and maximum number of items that patterns should contain. Modified the user interface so that algorithms can have up to seven parameters. Added a new feature to the CPT and CPT+ sequence prediction models. The user can now obtain information about how a prediction was made. By using the method getCountTable, one can obtain all the symbols and their scores calculated by the model. This explains what is the basis for a given prediction. the HAUI-Miner algorithm for mining high average utility itemsets in a transaction database with utility values. the HAUI-MMAU algorithm for mining high average utility itemsets in a transaction database with utility values using multiple minimum average-utility thresholds. Fixed a bug the USpan implementation such that some patterns could be missed (thanks to Tai Dinh and Tin Truong Chi for reporting the bug). Fixed a bug in Closed association rule mining with FPClose. Some exception was thrown in some rare case (thanks to Tarannum Zaman). Added a new optional parameter to several itemset mining algorithms to let the user decide whether transactions identifiers should be shown in the output file, for each pattern found. The algorithms that support this feature are: AprioriTID, AprioriTID_bitset, Apriori_TIDClose, Charm_bitset, Charm_MFI, Eclat, Eclat_bitset, DCI_closed, CORI. In the user interface of SPMF, the new optional parameter is displayed as "Show transactions IDs? (optional)". The SAX algorithm has now a new optional parameter "deactivatePAA". It allows to deactivate the transformation to the piecewise aggregate approximation (PAA) when applying SAX. This allows to convert a files containing several time series having different lengths to their SAX representations while preserving their original lengths (rather than converting all of them to time series having the same length). Fixed a bug in the MaxSP algorithm (thanks to Natalia Mord for proposing the bug fix). Improved the documentation of the clustering algorithms with some more interesting examples and pictures. Moreover, also did some minor improvements to the code of clustering algorithms. In particular, the input file format for clustering algorithms now let the user specify the names of attributes used to describe the instances. 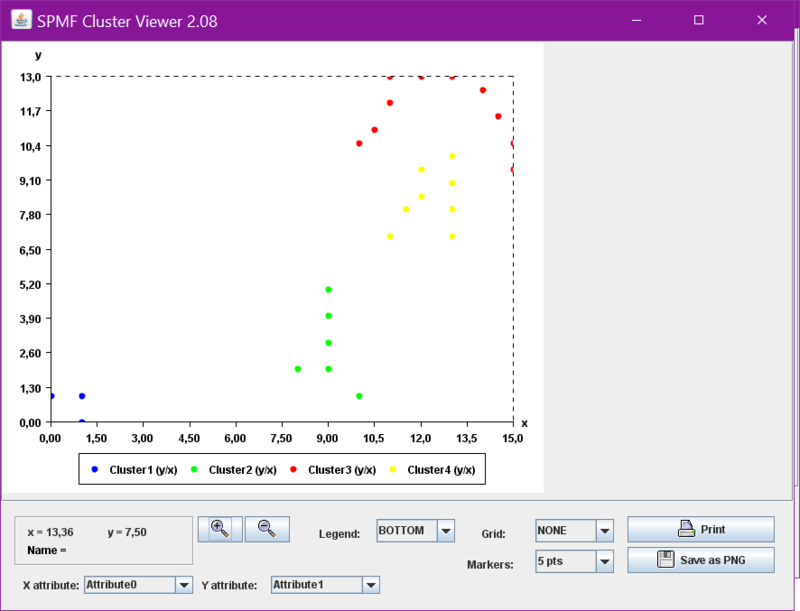 I have also improved the Cluster Viewer to let the user select which attributes should be visualized when displaying clusters. Thus the Cluster Viewer can now be used to visualize instances having more than 2 attributes. Fixed a bug in the user/interface and command line interface of SPMF for the parameter "required items" of the TKS algorithm. Moved the TimeSeries viewer to another package and added a few additional features to its user interface..
a label (a name) can be assigned to each instance in the input file. The names of instances are now displayed in the output of these algorithms. This provides more meaningful results. a separator such as " " can be provided as parameter to these algorithms. The separator indicates which character is used in the input file to separate values. As a result, most clustering algorithms are now compatible with the time series file format and can be applied to time series (when using the ',' separator). Fixed a bug when running the OPTICS algorithm in the user interface or command line interface of SPMF. Minor improvements to the Time Series Viewer. When the user moves the mouse over a time series, the name of the time series is shown. Also other minor changes. an implementation of the SAX algorithm is provided for converting time series to sequence(s) of symbols. This is useful to then apply traditional sequential pattern mining algorithms or sequential rule mining algorithms to time series. an algorithm to split a time-series into a given number of time series, or by number of data points. a vizualization tool called TimeSeriesViewer for visualizing time-series. Fixed an encoding bug for the conversion of chinese texts to sequences such that chinese characters were not appearing. Updated the developer's guide on the website with some minor modifications. Improved the graphical user interface and command line interface of SPMF so that more informative messages are shown to the user when an algorithm parameter is missing or when the value is of an incorrect type. This will make the user interface more user-friendly (thanks to Slimane Oulad Naoui for this suggestion). Added support for mining TEXT files with Chinese text (by supporting the Chinese punctuation). Added the support for TEXT files. Using the graphical interface or command line, it is now possible to apply most sequential pattern mining and sequential rule mining algorithms directly to a text file. There is two ways of applying an algorithm on a text file. The first way is to apply the algorithm "Convert_TEXT_file_to_sequence_database" to transform a text file into a sequence database. Then this file can be used with most algorithms for sequential pattern or rule mining using the user interface or command line. The second way is to rename the text file with the extension ".text". Then when using the graphical interface or command line, SPMF will automatically convert the file to the SPMF format, run the selected algorithm, and then show the results in terms of words in the text file rather than integers. This is a feature that has been requested by several users. It is useful for performing data mining on text files without having to write code for converting text to sequences as it was previously required. For now, SPMF only supports the default text file encoding supported by Java. In the future, some options will be added to let the user choose other encodings as well. There is a new example in the documentation that provides also some explanations about how to use text files when running algorithms using the source code version of SPMF. Moreover, a tutorial on the blog explains some of the possibilities for analyzing text documents using this new version of SPMF. A new system has been designed for adding new algorithms to SPMF. To add an algorithm, an instance of the class DescriptionOfAlgorithm must be created for the new algorithm in the package "ca.pfv.spmf.algorithmmanager.descriptions". It allows to indicate the type of input, output, the parameters, etc. of the algorithm. This is then used to automatically generate the list of algorithms in the user interface of SPMF, unlike in previous versions of SPMF where this list was hard-coded. In the future, the descriptions of algorithms could be used to build a more complex user interface where user could visually combine various algorithms as a workflow. Another interesting possibility is to provide a user interface to run multiple algorithms one after the other, or to launch experiments where the parameters are varied automatically. This will be considered for features in future releases of SPMF. Moreover, another idea is to use the algorithm descriptions for adding a plug-in system in SPMF for importing algorithms from other jar files. In the next few days, I will also update the developper's guide to add more documentation. Added the lift measure to the CMDeo algorithm (thanks to Ryan Panos). Updated the code of the GCD algorithm for association rule mining with an improved version (thanks to Ahmed El-Serafy, Hazem El-Raffiee). Fixed some minor errors in the documentation. Fixed a bug in the CMDeo algorithm that could trigger an ArrayOutOfBoundException . Fixed a bug in the Pascal implementation (the support of single items was incorrect in some cases). Fixed a bug in the user interface for the FP-Close algorithm. Fixed a bug in the VMSP and VGEN algorithms that occurred when maxLength was set to 1. Added an implementation of the MinFHM algorithm for mining minimal high-utility itemsets. Added a tool to remove utility information from transactions databases containing utility information. Added the original implementation of the EFIM-Closed algorithm for mining closed high-utility itemsets. Added the original implementation of the FHM+ algorithm for efficiently mining high-utility itemsets with length constraints. Fixed bugs in the new BIDE+ and PrefixSpan implementation that occurred for sequences containing multiple items per itemset. I have further optimized the new Prefixspan implementation, in the package ca.pfv.spmf.algorithms.sequentialpatterns.prefixspan. I have replaced the old implementation of BIDE+ with a new implementation. The new implementation is in the package ca.pfv.spmf.algorithms.sequentialpatterns.prefixspan. This new implementation is faster and more memory efficient (up to 10 times faster on some dataset, and uses less memory). I have tested this implementation quite well. But if you find some issues, please let me know. Note that some algorithms may still rely on the old implementation (e.g. the Fournier08 algorithm). I will further clean the code in upcoming versions of SPMF to avoid keeping two versions of BIDE+. Fixed a bug in the FOSHU and TS-HOUN algorithms. The absolute value of to(X) is now used to calculate the relative utility of an itemset X. In this new version, I have replaced the Prefixspan implementation with a new implementation, in the package ca.pfv.spmf.algorithms.sequentialpatterns.prefixspan. This is something that I have wanted to do for a while since the previous version had been implemented a long time ago. The new version is based on different design decisions and includes some additional optimizations. It can thus be more than 10 times faster than the previous implementation on some dataset and use three times less memory. This also makes the RuleGen algorithm faster since it relies on PrefixSpan. Note that some algorithms may still rely on the old implementation. Added the possibility to mine closed association rules using FPClose. The version using FPClose can be 10 times faster than the version using Charm for the step of rule generation because FPClose stores closed itemsets in a CFI-tree. Fixed a bug in DBScan, Optics, and the KD-Tree implementation. Added an implementation of the USPAN algorithm for mining high-utility sequential patterns. Added an implementation of the FCHM algorithm for mining correlated high-utility itemsets using the bond measure. Modified the output of TKS to remove the -2 at the end of each pattern found, so that the output is similar to other sequential pattern mining algorithms. This new version offers a new user user interface for vizualizing results. It is a window specifically designed for visualizing patterns found by pattern mining algorithms but it works with clustering algorithms and most algorithms. This window can be accessed when using the graphical interface of SPMF by selecting the checkbox "using SPMF viewer". The new window show the patterns found by an algorithm in a table, and it let the user apply some filters to select patterns or to sort the patterns by ascending or descending orders using various measures such as support and confidence (depending on the algorithms) by clicking on the column headers. This window for visualizing patterns should work with most algorithms offered in SPMF. If you find some bugs related to this new window for visualizing results, or if you have ideas to improve the user interface of SPMF, you may let me know. Besides, I fixed a few bugs. Added an implementation of the GHUI-Miner algorithm for mining generators of high-utility itemsets in a transaction database having utility information. Added an implementation of the CHUI-Miner algorithm for mining closed high-utility itemsets in a transaction database having utility information. Fixed a bug in MaxSP. No result where generated for minsup = 0 sequence. Now, if the user set minsup = 0 sequence, MaxSP change minsup to 1 sequence (because it does not make sense to generate patterns that do not exist in the database). Added a variation of the FHM algorithm named FHMFreq for mining frequent high-utility itemsets. This is a quite simple modification of FHM to add the minsup threshold. Fixed a bug in the graphical interface for the SPAM algorithm (thanks to Martin Böckle for reporting the bug). Added the minimum pattern length constraint for the SPAM algorithm. Added several sequence prediction algorithms to SPMF. 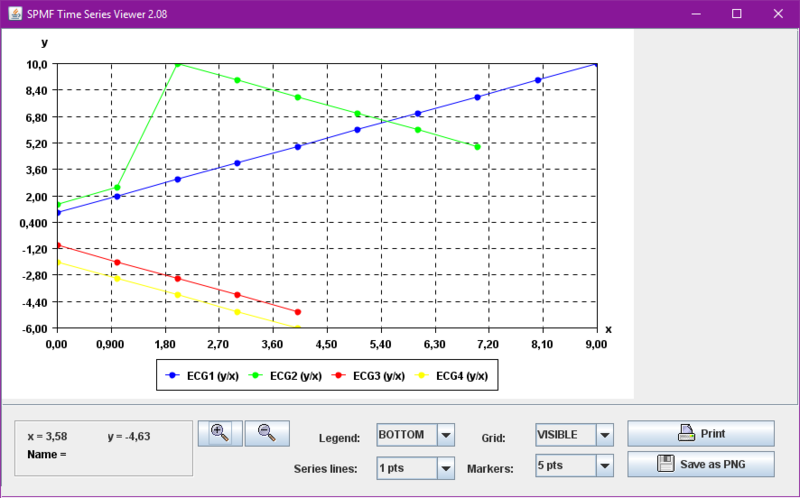 The algorithms are CPT+, CPT, PPM, DG, AKOM, TDAG and LZ78. Those algorithms are designed to predict the next symbol of a given sequence based on a set of training sequences. The algorithms are implemented by Ted Gueniche, as part of its Ipredict project. Added an implementations of FOSHU and TS-HOUN for on-shelf high-utility itemset mining. Added an implementations of EIHI and HUI-LIST-INS for incremental high-utility itemset mining. Added an implementation of HUSRM for high-utility sequential rule mining. Added an implementation of EFIM, d2HUP and HUP-Miner algorithms for high-utility itemset mining. Added datasets for on-shelf utility mining and high utility sequential rule mining on the "Datasets" page of the website. Fixed a bug in the "maxgap" constraint implementation for the TKS, CM-SPAM algorithms and other SPAM based algorithms, that sometimes occured when an item appeared multiple times in the same sequence. 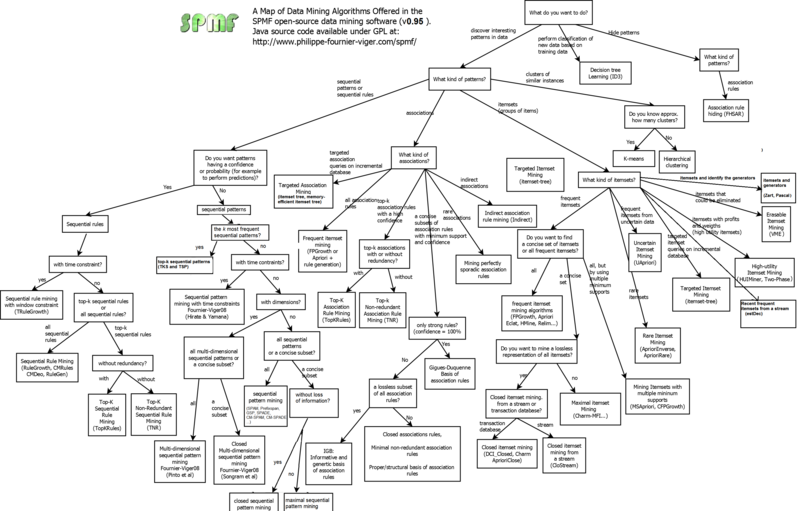 Updated the map of data mining algorithms. This version requires to have Java 1.8, installed on your machine. It may be necessary to update the Java SDK on your machine and perhaps also your development environment such as Eclipse. Added an optional parameter to SPAM, VMSP, VGEN and TKS to show the identifiers of sequences containing each pattern found. If this parameter is set to true, the identifiers of sequences will be shown in the output by these algorithms. Fixed a bug in the FPGrowth algorithm that was introduced in v96r14 when some optimizations where made to the FPGrowth code (thanks to Masanori Akiyoshi for finding the bug). The support of itemsets was in some cases incorrectly calculated. Fixed an integer overflow problem occuring only for very large datasets for FHM, FHN and HUI-Miner. Further optimization of memory usage for the Eclat, dEclat, Cori and DefMe algorithms. Fixed a bug in the correlation distance function for clustering. Fixed a bug that occurred when using the "maxgap" constraint in the VMSP, VGEN, CM-SPAM, SPAM and TKS algorithms (thanks to Choong Shin Siang and Wong Li Pei for reporting the bug). Optimized the H-Mine algorithm implementation. Fixed a bug in FHN. Added an implementation of the CORI algorithm for mining rare correlated itemsets from a transaction database. Added an implementation of the FPClose algorithm for mining closed frequent itemsets from a transaction database. Added an implementation of the FHN and HUINIV-Mine algorithms for high-utility itemset mining with negative or positive unit profit values. Added an implementation of the FPMax algorithm for mining maximal frequent itemsets from a transaction database. Fixed a bug in the dCharm_bitset implementation. The result was sometimes incorrect. The runAlgorithm() method of CommandProcessor is now public as requested by some user. Added an implementation of the Optics algorithm. Optics generates a cluster-ordering from a set of double vectors. From this ordering, various things can be done. I have implemented the method extractDBScan() method to use this ordering to generate DBScan style clusters. I have however not implemented the alternative extractCluster() method, described in the paper. Fixed a bug in the hash function of CloSpan, ClaSP and CM-ClaSP, that provoked a StackOverflow exception for these algorithms in some rare cases (thanks to Wen Zhang for reporting the bug and Antonio Gomariz for fixing it). Fixed a bug in the Zart algorithm (reported by Asmaa) that was generating an ArrayOutOfBound exception when no single items were frequent. Furthermore, I have modified the outpout of Zart to make it clearer and updated the documentation. Modified the graphical user interface of SPMF (files in the package ca.pfv.spmf.gui) so that when the user is launching an algorithm, it is now done in a separated thread and a button "Stop algorithm" is available to stop the algorithm execution if it is taking too much time. Added an implementation of the DBScan algorithm for density-based clustering. Added the feature of searching all points within a radius to the KD-Tree implementation. New feature for most sequential pattern mining algorithms: the user can now request to show the corresponding sequence ids for each pattern found. In other words, for each pattern found, SPMF can now show the ids of the sequences where the pattern appears. This feature was added in BIDE+, ClaSP, CM-ClaSP, CloSpan, CM-SPADE, CM-SPAM, SPADE, SPAM-AGP, GSP, PrefixSpan, TSP, MaxSP, FEAT and FSGP. The documentation will be updated soon... Moreover, I fixed some minor issues in the code of FEAT and FSGP (the code for saving to file was not working as expected for these algorithms). Added an implementation of the Bisecting K-Means clustering algorithm. Added more features to the K-Means and Hierarchical Clustering algorithms. Previously, the euclidian distance was the only distance function available. Now, the user can choose between Euclidian distance, correlation distance, cosine distance, Manathan distance and Jaccard distance. Update: 2015-02-19: Fixed a bug in the command line interface of SPMF (bug reported by Wen Zhang). Fixed bugs in the dEclat, dCharm algorithms and FIN/PrePost implementations. Added the "max gap" parameter for the VGEN, VMSP, TKS, SPAM, SPAM and CM-SPAM sequential pattern mining algorithms. It is an optional parameter that allows to specify if gaps are allowed in sequential patterns. For example, if "max gap" is set to 1, no gap is allowed (i.e. each consecutive itemset of a pattern must appear consecutively in a sequence). If "max gap" is set to N, a gap of N-1 itemsets is allowed between two consecutive itemsets of a pattern. If the parameter is not used, by default "max gap" is set to +∞. Fixed a bug in the Itemset-Tree and Memory Efficient Itemset-Tree implementations (thanks to Ryan G. Benton for reporting and fixing the bug). The support of itemsets was sometimes calculated incorrectly. Added an implementation of the EstDec+ algorithm, for mining recent frequent itemsets from data streams (thanks to Azadeh Soltani). Memory optimizations of the EstDec algorithm. The algorithm can now use up to 4 times less memory (thanks to Azadeh Soltani). Memory optimization of the FPGrowth algorithm to reduce the number of object creation. Reduces memory usage by up to 2 times on some datasets. Also optimized how FPGrowth enumerate all itemsets when an FP-Tree contains a single branch. Refactoring of classes in the package ca.pfv.spmf.gui to separate the main class file and command line interface (Main) from the graphical interface (MainWindow) and from the code for launching algorithms (CommandProcessor) used by both the command line interface and GUI. From now on, the class "Main" will be the main class of the SPMF library. Refactoring of the CM-ClaSP and ClaSP code so that the debuging code for showing the trie is now located in a separated class (ShowTrie). This is to avoid HeadlessExceptions when running ClaSP/CM-ClaSP in a headless environment (bug reported by Wen Zhang), that is an environment where graphical interface is available (e.g. on some Linux servers). Fixed a bug in BIDE+ that was causing ArrayOutOfBound exception on some datasets (thanks to Mehran Memon for reporting this bug). Other minor modifications to remove some warnings. Fixed a bug in dEclat implementations. Due to an error in how methods were overloaded, some code of Eclat was executed in dEclat. Fixed a bug. MaxSP was not working when executed from the GUI. Optimization: replaced StringBuffer by StringBuilder in all classes (since it is more efficient). Added the BMS2 dataset to the "dataset" page of the website. allow the user to specify items that need to appear in patterns found. allow the user to specify the minimum/maximum length of patterns to be found. Added more features to the RuleGrowth/TRulegrowth algorithms. User can now specify the maximum size of rule antecedents/consequents to be found. modified TKS to allows the user to specify items that need to appear in patterns found. modified TKS to allows the user to specify the minimum length of patterns to be found. Added the "fix transaction database" tool. It is a tool that fix some common problems that may be found in transaction database files created by users. This tool (1) removes duplicate items in transactions of a transaction database and (2) sort items in transactions (those requirements are assumed by most itemset mining algorithms). Added the FIN and PREPOST algorithms (thanks to Zhihong Deng for providing the original C++ source code, that I have converted to Java). These two algorithms are very recent frequent itemset mining algorithm and are very fast. According to some preliminary experiments, for example, PrePost can be a few times faster than FPGrowth on some datasets. Added implementations of the LCMFreq, LCM and LCMMax algorithms for respectively mining frequent itemsets, closed itemsets and maximal itemsets (thanks to Alan Souza for providing an implementation of LCM). I have modified the source code to add a few optimizations. The implementation of LCM is based on the paper describing LCM v.2 by Uno, although it does not perform transaction merging yet (some more optimizations could be added in the future). LCM is an interesting algorithm because it was the winner of the FIMI 2004 competition. Update (2014-11-24): There was a bug in my modifications of LCM to implement LCMMax, so LCMMax is temporarilly removed from the source code until I can fix the issue. It may takes a few days or more before I can fix it. Fixed a bug in the compare() method of the Rule class used by TNS and TopSeqRules (thanks to C. Albert Thompson for reporting the bug). Added a tool to add consecutive timestamps to a sequence database (this is useful for generating datasets with timestamps for testing algorithms that require timestamps). Added a tool for converting a transaction database to a sequence database (this can be useful for generating datasets for experiments, though in real-life, it may not make sense to convert transactions without ordering to sequences with an ordering). Added a tool to add synthetic utility values to a transaction database (this is useful for generating datasets to be used in high utility itemset mining). Added an implementation of the ERMINER algorithm for sequential rule mining. Added an implementation of the IHUP and UP-GROWTH algorithms for high-utility itemset mining (thanks to Prashant Barhate for implementing these algorithms). Fixed a bug in Eclat so that frequent itemsets found where not correctly separated by their size and another bug in Eclat such that Eclat was not pruning some itemsets containing 2 items when the triangular matrix was deactivated. (thanks to Abdalghani Abujabal). Added a tool to convert a sequence database to a transaction database. This tool is useful for example to apply an algorithm designed for a transaction database to a sequence database (e.g. mining association rules in a sequence database). Added a tool to generate statistics about a transaction database. Fixed a bug in the association rule generation using CFPgrowth that was introduced in a previous version. Fixed a bug in the LAPIN implementation because of overflow and cleaned the code, and added some comments. 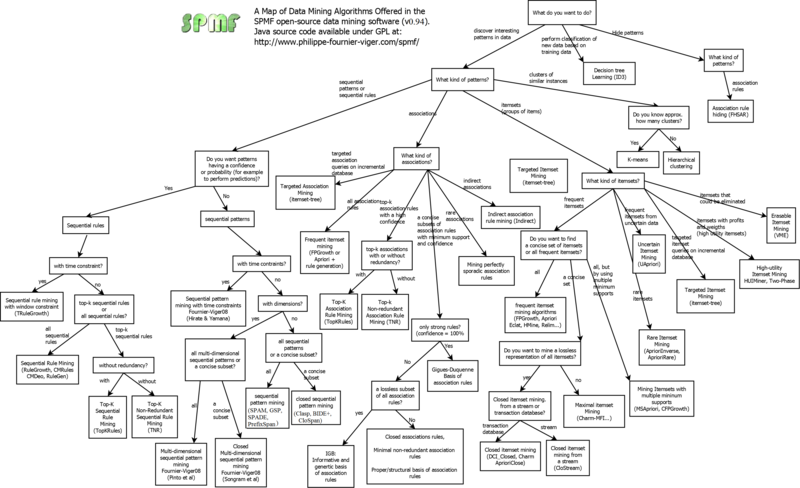 Added the LAPIN (aka LAPIN-SPAM) algorithm for sequential pattern mining. This is a first implementation in SPMF based on the LAPIN-LCI variation of LAPIN described in the technical report of LAPIN. Added the dECLAT and dCHARM algorithm for mining frequent itemsets. Those algorithms are respectively variations of the Eclat and Charm algorithms. The difference is that it uses the diffsets data structure rather than tidsets. We provide an implementation of dEclat using sets of integers to represent diffsets ("dEclat") and one version using bitsets ("dEclat_bitset"). For dCharm, only a version using bitsets is provided ("dCharm_bitset"). Added the DEFME algorithm for mining frequent generator itemsets using a depth-first search. Fixed bugs in FEAT/ FSGP that occurred when multiple items per itemsets appeared in input sequences. Optimized the code for association rule generation. Up to 10 times faster on some datasets. Improved the source code for closed association rule mining and merge some classes. Introduced a class ca.pfv.spmf.algorithms.ArraysAlgo to put all important algorithms on sorted list of integers that are shared by several algorithms (to remove some redundancy in the source code). Optimization of the binary search in Apriori based algorithms (Apriori, AprioriClose, AprioriInverse...), as well as in FHM and HUI-Miner. algorithms. I have re-implemented most of the code. Added a performance comparison with a closed source data mining library in the "performance" section of the website. FEAT, FSGP and VGEN for mining frequent sequential generator patterns from a sequence database. fixed an array out of bound exception in the FPGrowth algorithm that occurred when all items are infrequent (thanks to Aman). fixed a bug in association rule generation with CFPGrowth (AlgoCFPGrowth.java), thanks to Manperta Negara Situmorang. Major optimization of all FP-Growth based algorithms (FPGrowth, FPGrowth_with_strings, CFPGrowth++), thanks to Dan Cappucio. The modification is to add mapItemLastNodes in the FPTree / MISTree classes (see the "performance" section of the website for an overview of the speed improvement). added the GoKrimp and SeqKrimp algorithms (by Thanh Lam Hoang et al) to discover compressing sequential patterns directly of by post-processing. CFPGrowth has been renamed CFPGrowth++ since it includes the optimizations proposed in CFPGrowth++. added the possibility to generate association rules from the output of the CFPGrowth algorithm. improved the documentation web page of the website to add the description of the file formats of each algorithm. fixed a bug in the ARFF ResultConverter.java file. fixed rounding inconsistencies among sequential pattern mining algorithms (thanks to A. Pramudita). fixed a bug in the trimBeginingAndEnd method of PseudoSequenceBIDE.java for the BIDE+ algorithm. Cleaned the code of FPGrowth for the case of a tree with a single path (thanks to R. Loomba). Closed sequential pattern mining by post-processing with PrefixSpan and SPAM. fixed a bug in Charm (bug also introduced in 0.93 due to refactoring). 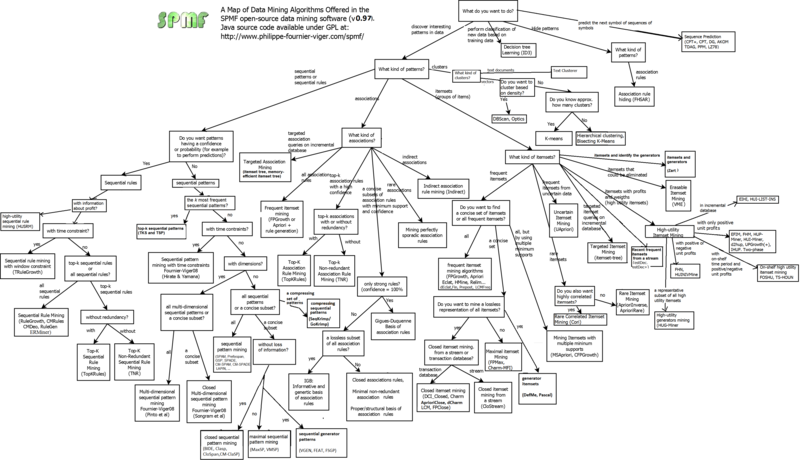 Updated the map of data mining algorithms and documentation. fixed a bug in dataset generation that was introduced in version 0.93d. old documentation for this version. old source code for this version. old jar file for this version. added a new datasets page on the website. added support for the ARFF file format (a popular file format that represent a relational database table as a text file). The ARFF format can be used as input in the command line interface and graphical interface of SPMF by algorithms that take a transaction database as input (most itemset mining and association rule mining algorithms). This version support all features of ARFF except that (1) the character "=" is forbidden and (2) escape characters are not considered. Note that when the ARFF format is used, the performance will be less than if the native SPMF file format is used because a conversion has to be performed. However, this additional cost should be small. Note that SPMF also support a few other formats besides ARFF (see the last examples in the documentation on file conversion for more information). However, only the ARFF format is converted on-the-fly (other formats have to be converted manually before applying an algorithm). 36 datasets in the ARFF format can be found in the datasets page of this website. added a tool to convert the CSV format with positive integers to a transaction database in SPMF format. fixed a bug in the sequence database generator and transaction database generator. Several packages and files have been renamed for a better organization of the source code. Merged some files that were duplicated in various packages for less redundancy. 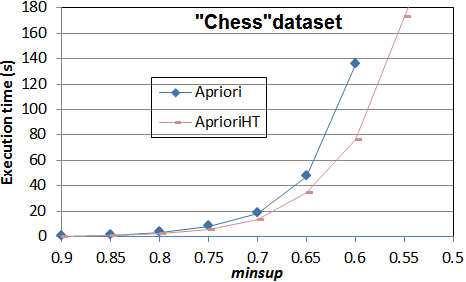 Optimized several Apriori-based algorithms such as AprioriRare and AprioriInverse. Some algorithms have been optimized to use better data structures such as using arrays instead of list of integers. Added 7 algorithms to the GUI: Apriori_TIDClose, AprioriTID, Apriori - Association rules, Sporadic association rules, Indirect association rules, IGB, MNR. Fixed some small bugs in the source code. Tried to standardize as much as possible the output files written by the algorithms so that algorithms performing the same task will output the same file format. The CHARM-MFI algorithms was not generating the correct result. I have found that the problem is the algorithm itself, which is incorrect as it is described in Szathmary (2006) for some special cases. I have adapted the algorithm so that it generates the correct result. I have removed four less popular algorithms that were not well-documented and not offered in the release version of SPMF: the algorithm for mining pseudo-closed itemsets, the Guigues-Duquenne basis, proper basis and the structural basis of association rules. If you want these algorithms, you can download version 0.92 of SPMF to get them. Added the maximum pattern length constraint to PrefixSpan and SPAM algorithms. fixed a bug that occurred when prefixspan_with_strings was called from the user interface or command line. old developer's guide for this version. fixed a bug in the calculation of the lift measure for association rules. added an implementation of HUI-Miner, one of the best algorithms for high utility itemset mining. added an implementation of Apriori that uses a hash-tree to store candidates to calculate the support and generate candidates more efficiently (it is named "Apriori_with_hash_tree" or "AprioriHT"). It can be up to twice faster than the previous version (a performance comparison). added a tool to generate transaction databases. added a tool to generate sequence databases. added a tool to convert sequence databases to the SPMF format. added a command line interface to run algorithms from the command line. added an implementation of TNR for top-k non-redundant association rule mining. added an implementation of TNS for top-k non-redundant sequential rule mining. clean the source code a little bit. fixed some small bugs in the Indirect, FHSAR and ZART algorithms. added an implementation of CFPGROWTH for mining itemsets with multiple support thresholds (implemented by Azadeh Soltani). added an implementation of MSAPRIORI for mining itemsets with multiple support thresholds (implemented by Azadeh Soltani). fixed a small bug in TRULEGROWTH. added implementations of TRULEGROWTH and BIDE+ that accepts strings instead of integers as input. improved the user interface so that (1) example parameter values are shown for each parameter and (2) that percentage values can be entered either in decimal format (e.g. 0.5) or as a percentage (e.g. 50%). modified the user interface so that algorithms are presented by their category in the combo box such as "sequential pattern mining", "sequential rule mining", "itemset mining", "clustering", etc. optimized the basic Apriori implementation with binary search for checking subsets of candidates, arrays of integers instead of lists, and more. added several algorithms to the GUI version of SPMF: K-MEANS, TWO-PHASE, VME, ZART, RELIM, RULEGEN, SEQ-DIM, etc. improved the version of K-Means and the hierarchical clustering algorithm so that it can work with vectors and cleaned the code..
cleaned the code of algorithms for mining multi-dimensional sequential patterns and modified them so that they save the results to a file. cleaned the source code of Apriori-based algorithms. v 0.84 - 2012-07-15: added a few algorithms for building, updating and querying an Itemset-Tree. An itemset tree is a special structure representing a database that allows efficiently generating targeted association rules, frequent itemsets and to get the support of any itemset. This structure can be updated incrementally (only available in the source code version of SPMF). v. 0.83 - 2012-07-04: added the possibility of mining association rule with the lift measure and the minlift threshold. v. 0.82 - 2012-06-30: fixed a bug in the SPAM implementation that occurred when minsup =0 (thanks to D. Bhatt). v. 0.81 - 2012-04-13: improved the SPAM implementation. The number of bits by sequence is now variable. The algorithm is therefore more memory efficient and can run on larger datasets with longer sequences. v. 0.80 - 2012-04-08: improved the user interface (thanks to Hanane Amirat), changed the license of the software to GPL v3, fixed a minor bug in the TRuleGrowth algorithm, cleaned the source code of several algorithms by removing some unused methods. v. 0.79 - 2012-03-17: added five Apriori-based algorithms to the GUI version (Apriori, AprioriClose, AprioriRare, AprioriInverse, UApriori) and made some minor improvements. Added the TRULEGROWTH for mining sequential rules with the window size constraint. Added the TOPKRULES algorithm for mining the top-k association rules in a transaction database. Added the TOPSEQRULES algorithm for mining the top-k sequential rules in a sequence database. Added an implementation of FPGROWTH that saves the result to a file instead of keeping the result into memory. Added a simple graphical user interface (ca.pfv.spmf.gui.MainWindow) that allows to run 17 main algorithms (other algorithms will be added to the user interface later). v.0.77 - 2011-10-28: Added an implementation of FHSAR for association rule hiding. v.0.76 - 2011-10-22: Added faster and more memory efficient implementations of AprioriTID, ECLAT and CHARM that use bit vectors for representing tids sets. v.0.75 - 2011-10-18: Added an implementation of INDIRECT for mining "indirect association rules". v.0.73 - 2011-09: cleaned the implementation of PREFIXSPAN and BIDE+ and made some optimizations, added an implementation of RULEGEN for generating sequential rules from sequential patterns. v.0.72 - 2011-07: Added implementations of RULEGROWTH for mining sequential rules,ID3 for creating decision trees, VME for mining erasable itemsets. Also, I cleaned a little bit the implementations of K-Means, the hierarchical clustering algorithm, AprioriTID and Apriori_TIDClose, CMRules and CMDeo. v.0.71 - 2011-02-01: fixed a bug in the CMRULES and CMDEO algorithms. v 0.70 - 2011-01-06: added an implementation of the H-MINE algorithm for mining frequent itemsets. v 0.69- 2010-11-27: added two implementations of the DCI_CLOSED algorithm for mining frequent closed itemsets (one straigthforward implementation and one with optimizations). the TWO-PHASE algorithm for mining high-utility itemsets, Apriori_TIDClose for frequent closed itemset mining, and CMRULES and CMDEO algorithms for mining sequential rules. v 0.66 - 2010-08-25: added an implementation of AprioriTID and some code for generating association rules by using FP-GROWTH. v.062 - 2010-04-11: fixed a bug in the triangular matrix used by the CHARM and ECLAT algorithms. v.049 - 2008-12-07: initial release.